Environmental and industrial measurement specialist Vaisala has expanded its field support team and opened a new operations center in Birmingham in the UK, to better support service needs for its Triton Wind Profiler. The expansion comes as remote sensing technology continues to be more widely adopted across a broad range of international wind energy markets. Vaisala recently shipped its 1,000th Triton to Minneapolis-based wind developer PRC Wind. The new operations center will enable Vaisala to provide better technical support coverage around the world, including for installations in Indonesia, Iceland, Panama, China and Japan. Tero Muttilainen, offering manager at Vaisala, said, “With remote sensing units increasingly replacing met masts as developers’ preferred method of wind measurement, there’s a need to provide additional support and build out global supply chains. “Typically, a wind measurement campaign will gather 18 months’ worth of data prior to a wind farm becoming operational. Triton’s latest milestone in having collected 25 million hours of data is a testament to its increasing role in these campaigns worldwide. When it comes to emerging wind markets, Triton possesses a number of practical advantages over traditional met masts and other remote sensing systems. Many prospective sites, for instance, are located far from the power grid, in challenging terrain or in heavily forested areas. Here Triton’s low power consumption and small footprint make it ideally suited for hard-to-reach areas. However, moving into areas of complex terrain poses an additional challenge to maintaining the accuracy of the wind measurement data recorded. 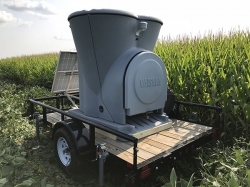 The effects of complex terrain on wind measurement using remote sensing devices were previously highlighted in a study produced by Vaisala and WindSim, a pioneer in computation fluid dynamics (CFD) modeling.